It is a still life water color…With no glass on the windows, there is a clear view of the cloudy sky above, leading one’s thoughts to questions like – what happened to the window panes, what shattered the glass and what left the deserted houses to the mercy of the weather and its present inhabitants – wasps, spiders, pigeons and the dog…? The crumbled bricks and dust cover the once warm, shining wooden floors. Hues of grey and browns cover the once vibrant colors of this paradise. Many stories were lost forever in these tattered houses when they were deserted and left for decay; the decay which now has its own story to tell, speaking of mutability – the process of our life. 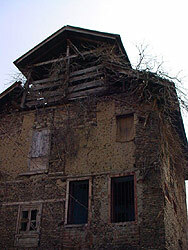 In this decay the people of Kashmir look for the stolen gaiety, the splendor, and the colors of the past. Living in this world of optimism and hope, they celebrate every day of their life for being alive. 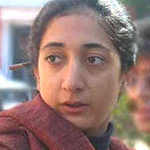 As I walked through the streets in downtown Srinagar, dotted with such cold skeletal houses in a cesspool of misery, I could feel warmth in the ice cold streets –warmth of the people, their hearts, almost as if rekindling an alluring candle. Scratch the upper crust of Kashmir soil, and what comes to light is the culture and civilization which is not dead in time, but living and pulsating…This is the hope and confidence I saw in the eyes of artisans with whom I was conducting a workshop in Srinagar, with the papier mache craftspeople. The technique followed in producing papier mache products is still the same old traditional one. The forms and the products though have evolved with times. Earlier the products made were mainly kalam daani, palanquins, ceiling panels, etc where as now one gets to see products such as Christmas decorations, jewellery boxes, photo frames, vases etc. The main processes involved here are Sakhtasazi, making the basic form, and Naqashi, painting the surface with intricate patterns. Sakhtasazi is derived from sakht (Persian word for basic), and sazi (the act of evolving). 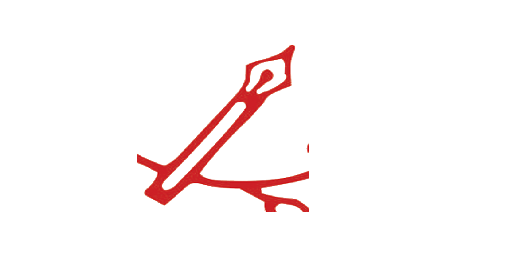 Sakhtsaz, therefore is the maker of the basic form, object. 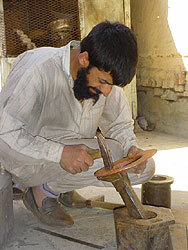 A Sakhtasazi karkhaana is normally owned by an individual craft worker, and is an extension of his household. The number of karkhanas have now-a-days reduced tremendously, owing to the reducing demand of this painstaking method of production, which is being replaced by the easier and cheaper substitute – wood. 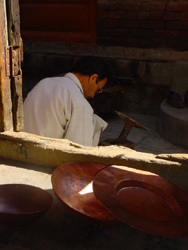 Traditionally, a sakhtasaz grinds thoroughly soaked paper in an okhli, with rice flour paste, copper sulphate, which is an insecticide and sometimes shreds of cloth, into a pulp. The pulp is then pressed on moulds, made of wood, metal or clay. These are then left in the sun to dry thoroughly. Once it solidifies, it is cut from the mould with a fine saw. The two halves are joined together with glue. The surface is evened and then coated with a white layer of gypsum and glue. When this layer is dry it is rubbed with a chunk of over baked red clay called “kurkot” to produce a finely burnished surface. The naqash, the artist, then paints on the forms prepared in the karkhana. The ustad in a naqashi karkhana normally owns the place and is held in high esteem by the shagirds, The place of work is also the most comfortable room in the household, giving it the due respect and importance. The designs used in papier mache naqashi are very intricate and their application requires great skill and accuracy. The patterns are painted in free hand and are drawn from the reservoir of the naqash’s memory. 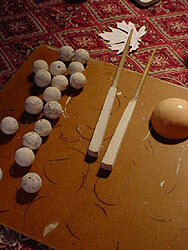 Traditionally the brushes used for the purpose were made of cat’s hair. Even the colors that were used earlier were produced very painstakingly through a long and laborious method, out of stone, minerals and vegetables and flowers. In some exquisite pieces real gold or silver leaf is used in naqashi. Gold leaf is applied by first painting the desired portion with a mixture of glue and sugar. While the mixture is still sticky, the gold leaf is applied to the surface and it adheres only to the portions painted with glue and sugar. For liquid gold or silver paint, the leaf is mashed with fingers, in glue, salt and water until it completely dissolves. Gold work is burnished with an agate stone. While painting, the detailing in gold is done in the end, after which a coat of lacquer, made of linseed oil and pine resin is applied. 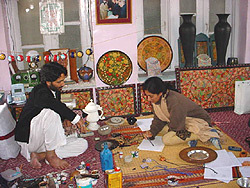 The main motifs that one traditionally finds in papier mache of Kashmir are derived by the naqash from the valley – lotus and iris – sosan ; water lily – gule-nilofar ; narcissus – nargis ; chinal leaf motif ; tree of life – kalp vriksha ; and apple and rose blossom – gule – vilayat. The most descriptive patterns representing the grandeur and spirit of Kashmir are the “gul-andar-gul” and the “hazaara”. Non figurative patterns are normally enclosed with a border, “dauadar”. 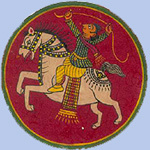 If the pattern forms a complete circle, it is “chand-dar” and if in a quarter moon shape, it is “chand-chautahi”. If the pattern forms an arch, it is “mehrab”. The traditional designs and patterns witnessed the artisans’ affinity with nature and admiration for the rich color and beauty found in the environment surrounding them. However, in the present circumstances, they look beyond the winter frost and the summer dust, trying to hold on to what little they have got, trying to shine light back on beauty and get a feel of the walk-in-paradise, called Kashmir.